savory nest: Blackened Halibut with a Sauté of Sweet Orange Tomatoes, Marinated Artichoke Hearts, Kalamata Olives & Arugula... Elegant and Easy! 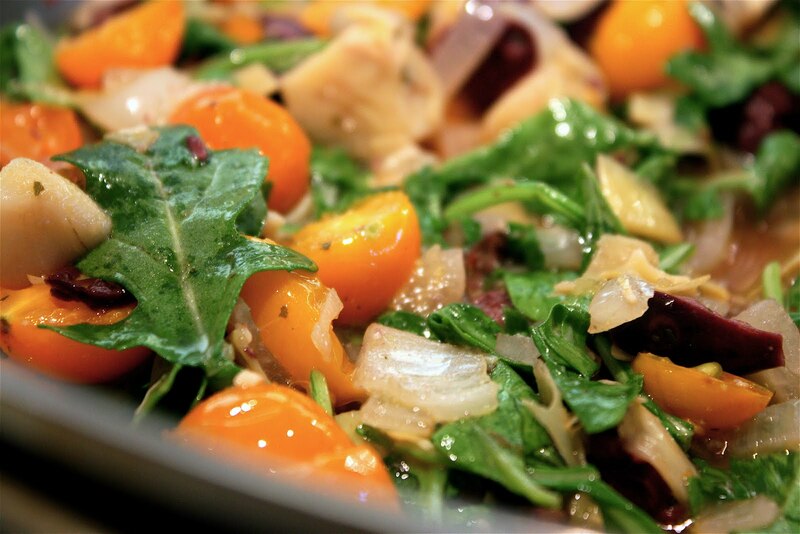 Blackened Halibut with a Sauté of Sweet Orange Tomatoes, Marinated Artichoke Hearts, Kalamata Olives & Arugula... Elegant and Easy! This particular recipe was inspired by a trip we took to Oregon's Willamette Valley wine country on a beautiful September day, more than a year ago. It was one of those ridiculously crystal clear, brilliantly blue-skied days that make our Northwest landscape sparkle in a way that you need to see to believe; the kind of day that begs to be captured on canvas, and bookmarked in your heart. Though our lush, year-round emerald green hillsides might easily hint at our healthy rainfall, you'd be hard-pressed to think that anyone ever suffered from what I call "drizzle deliria" when one of these spectacular days emerge. We can have weeks of endless downpour, and fizzled spirits, but just let those blue skies shine through... for even a minute... and all is instantly forgotten (and forgiven). Rain? What rain? 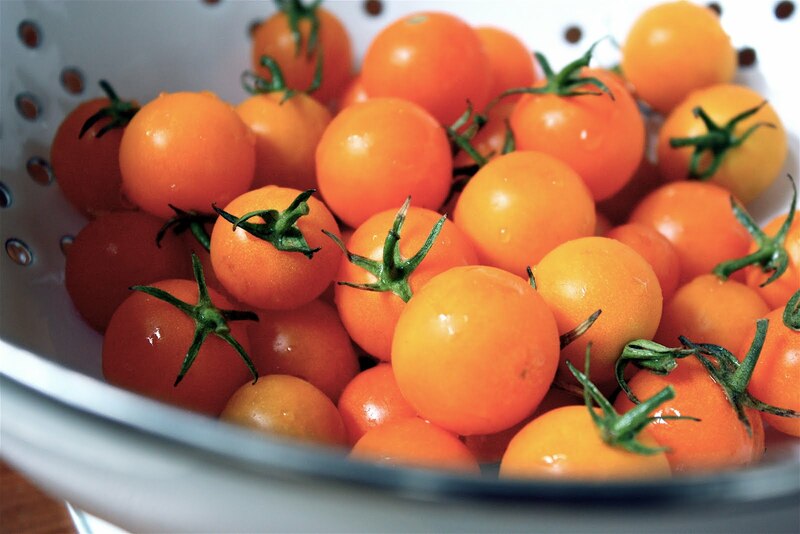 Here, the freshness of sweet miniature orange tomatoes (in markets right now!) 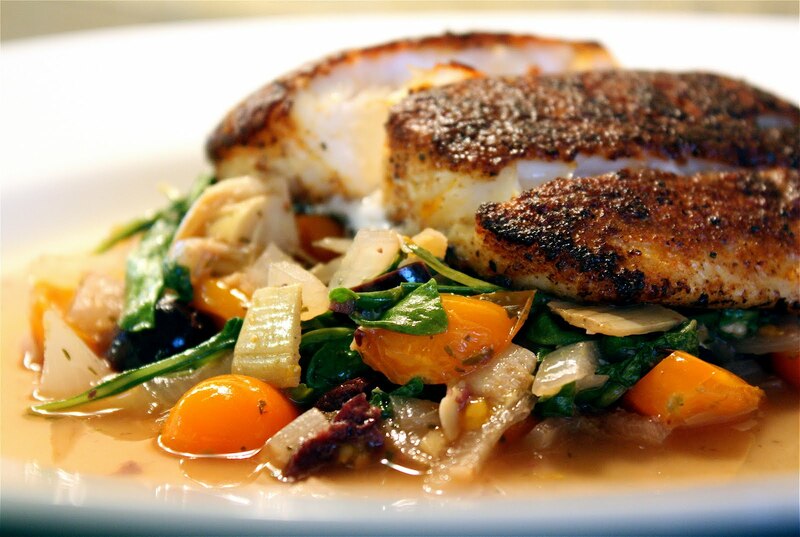 are combined with peppery arugula, marinated artichoke hearts, and fruity kalamata olives to make a savory sauté that's then topped with a flavorful blackened halibut. Beautiful, elegant... and SO quick and easy to make! 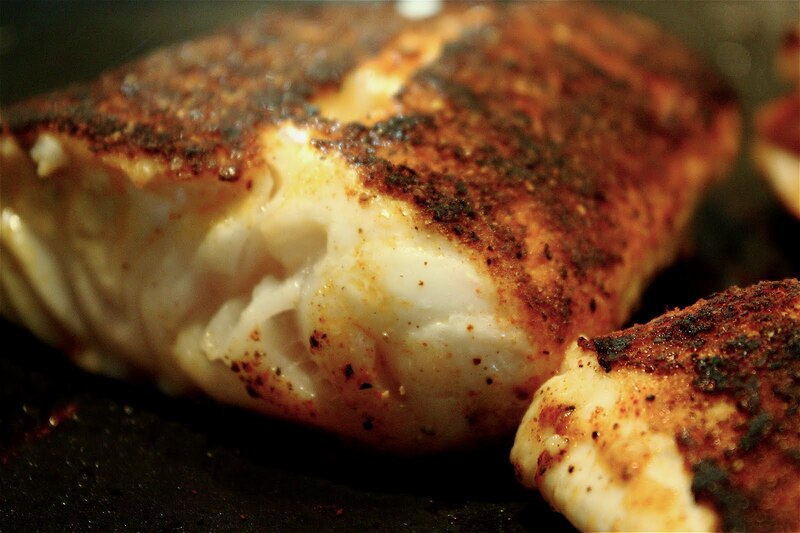 Halibut is a distinctly mild fish that adapts beautifully to a multitude of seasonings, making it especially great for rich broths, bold rubs, and creative relishes. Whether on the grill, in the oven, or sautéed in a pan on the stove, its firm flesh and clean flavor make it uniquely versatile for a variety of platings. The entire dish comes together so quick. The sauté of onions, artichokes, olives, and tomatoes is started first and is ready in minutes. Then it's simply set aside while you get your halibut started. 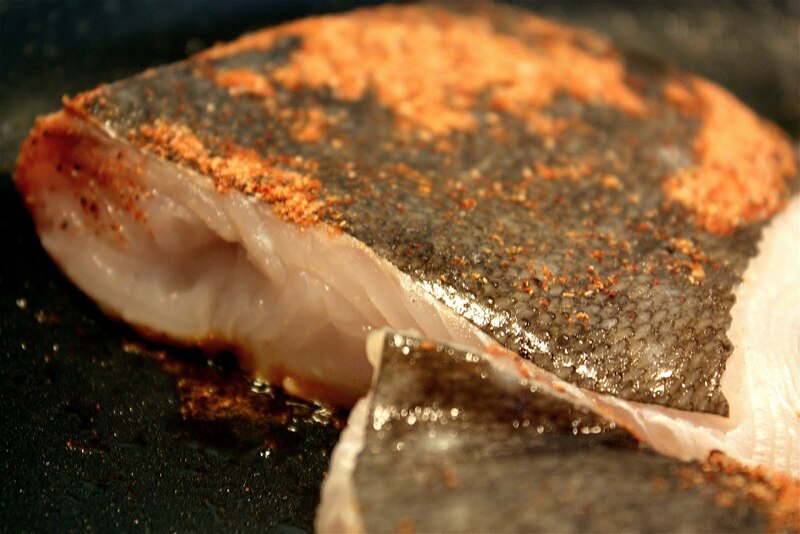 The flesh side of the fish is coated with a blackening spice mixture, then seared quickly in a skillet on the stovetop and popped into the oven to finish off... taking mere minutes! 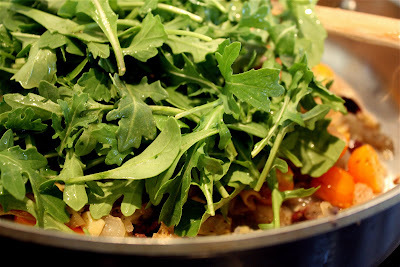 Then, while it's in the oven, arugula is added to the sauté set aside earlier and given a quick toss over some heat. Each dish gets plated with a bit of the sauté and then topped with a halibut fillet. It's beautiful, elegant... and so quick and easy to make! Though it won't transport you to a verdant vineyard set in the lush hills of the Willamette Valley... it will delight (even on the grayest of days)! 2. Combine coriander, paprika, salt, and pepper in a shallow dish (like a glass pie plate). Mix "blackening" spices to combine well. One by one, coat each halibut fillet (flesh side down) in spices by gently pressing fish in mix, repositioning and pressing again, until well coated. 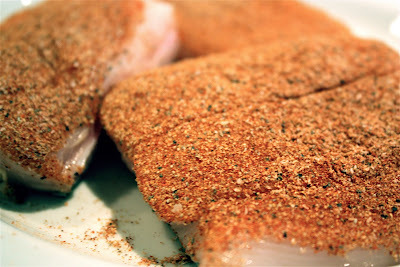 Turn fillets, seasoned side up in dish (letting them rest on remainder of spices, if desired), and set aside. 3. Heat 2 tablespoons olive oil in a large skillet over medium high heat; add onions. Cook approximately 1 to 2 minutes, until onions are just slightly translucent. 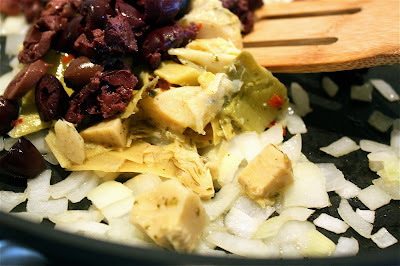 Add chopped kalamatas and chopped marinated artichoke hearts, continue cooking for another minute or two. 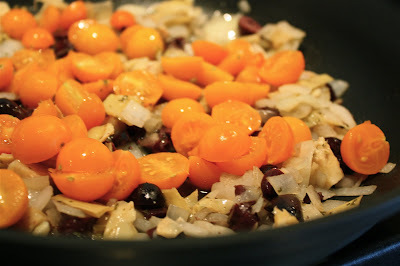 Add in reserved artichoke marinade oil, sweet orange tomatoes, and white wine. Heat mixture through for another minute. Set aside. 4. Heat remaining 3 tablespoons olive oil in another large skillet over medium high heat. Add halibut, seasoned flesh-side down, to pan. Sear fish for approximately 4 minutes, until flesh is beautifully crisped and golden ("blackened"). Flip fish and continue to sear, skin-side down, for another 4 minutes. Transfer fish (flesh-side up) to a baking pan and place in heated oven to finish cooking, approximately 5 to 8 minutes depending on thickness. Watch fish carefully to avoid overcooking. (Test doneness by inserting a toothpick or bamboo skewer into thickest part of fish; there should be a slight resistance if fish is done. Or, insert tip of a knife into thickest part of fish. It should flake easily but still appear moist. Remember that it will continue cooking a bit after it's removed from heat, so keep this in mind.) When done, remove from oven and set aside. 5. 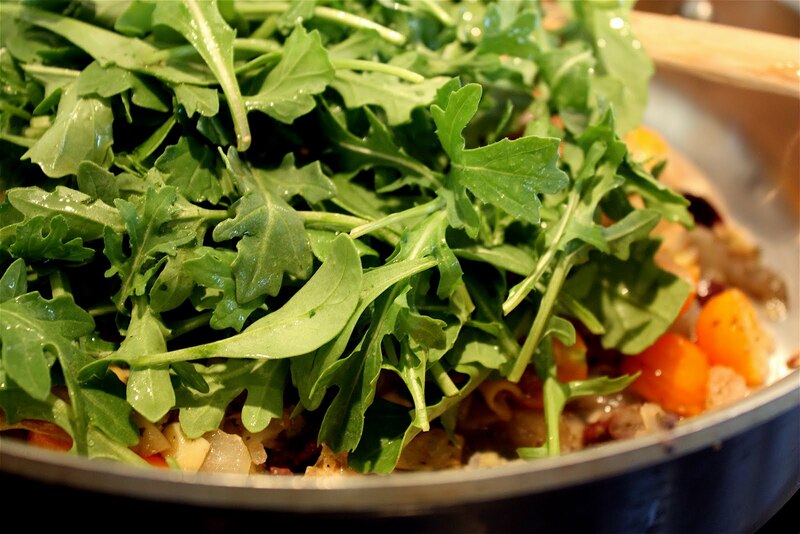 Return sauté mixture (set aside earlier) to heat and add in fresh arugula. Cook for 1 or 2 minutes, just until greens begin to wilt. Remove from heat; divide among four serving plates. 6. Lay one halibut fillet atop each plating of sautéed mix. *If larger cuts are selected, increase amounts of blackening spices to accommodate.